Firewood racks have long been popular in America, but they're not the only way to cure your firewood. 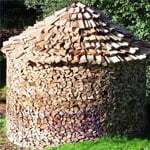 In Germany, the Holz Hausen is a fundamental way to stack and cure unlimited amounts of firewood without the use of a rack. These circular stacks are not only highly functional, but also quite aesthetically pleasing to look at. With only a few steps to follow, and little to no supplies required, you can build yourself a beautiful Holz Hausen in your neck of the woods. Start by driving a tall stake into the ground to mark what will be the center of your Holz Hausen. The stake should be around 7-8 feet tall. After driving it a foot or so into the dirt, measure and mark your stake 5 1/2 feet up from ground level. You'll build a ring of firewood around the stake, and as it gets larger, the wood will slightly fall inward to rest against the stake. Now the fun begins as you lay your firewood around the stake. Be sure to leave an approximately 1-foot space between the stake and the firewood. Lay each piece so that the smaller end of the log is facing inward and the thicker end is facing away from the stake. This will help prevent pieces from falling out. Once you've finished stacking a nice, even, two-layer ring around your stake, stack a perpendicular layer (lengthwise) like a mantle. This will help build the foundation for the next two layers of firewood. As you build your Holz Hausen, you'll have smaller pieces of scrap wood that don't fit well in the ring. You still want to hold onto those for kindling, so where should you put them? 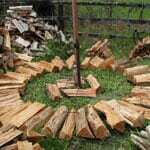 There should be an empty space inside the ring of firewood. Throw your little scraps in the gap. As you go, it should fill a bit with scraps in the middle, helping solidify your structure. 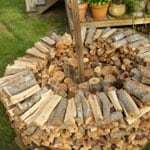 Once the wood is fully cured, you can stack it on your firewood rack and place the inner kindling in a separate pile or pale to help you get fired up. 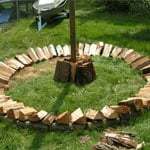 Once your firewood ring reaches the 5 1/2 foot mark you made on your stake, you can stack wood backwards (smaller ends out and thicker ends in) so it slopes outward. Once you have an even outward sloping ring on top, cover the top with bark to protect it from rain and snow. Bark will allow it to breathe, but will help prevent the firewood from becoming saturated. Now sit back and take in the beauty of your very own Holz Hausen while you wait for the wood to season. You'll be surprised at what a great outdoor conversation piece it makes, but even more surprised to find how well it works. Building a Holz Hausen - Find Out How to Age Your Firewood the German Way. Our log splitter how-to library can help you pick the perfect electric log splitter, gas log splitter, 3-point hitch log splitter, skid steer log splitter or log splitter accessory.